Camels — for centuries venerated as the “ship of the desert” — are a familiar motif in artworks from the kingdom. Al-Jouf, Saudi Arabia: Squinting in the Saudi desert, Hussain al-Khalifah points at his unprecedented archaeological discovery — camels carved on russet-hued rocky spurs that could shed new light on the evolution of rock art. Around a dozen humped sculptures, some of them damaged from erosion and vandalism, are possibly around 2,000 years old and were recently found in a private property along a desert crossing in the northern province of Al-Jouf. Chiseled on three rocky spurs, the sculptures, which also depict equids, or hoofed mammals, show a level of artistic skill unseen in other rock art forms in the Saudi desert. They could help unravel the mysteries of ancient life in the Arabian peninsula. “They are a work of artistry and creativity,” Khalifah said, giving AFP a tour of the desolate area in Al-Jouf, now well known in archeological circles as “the camel site”. 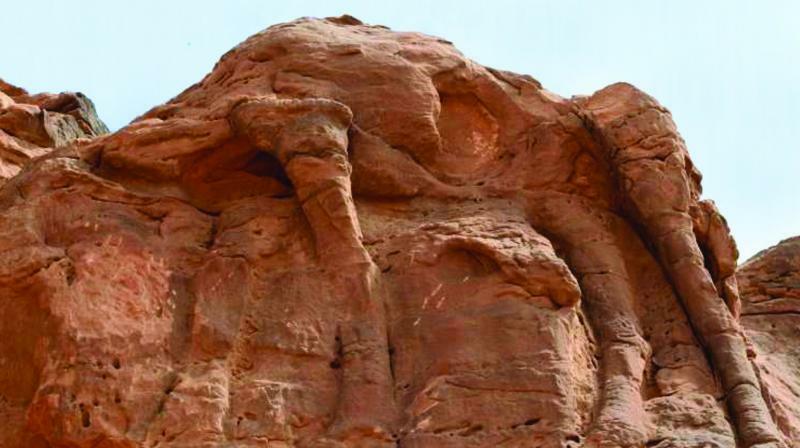 Khalifah, part of a Franco-Saudi research team that explored the site in 2016 and 2017, said he accidentally discovered the carvings some years ago when a local friend told him about a “camel-shaped mountain”. “Instead when I visited the area, I found camels were carved in the mountain outcrops. This is truly unique,” he said. But the three dimensional engravings in Al-Jouf, some featuring only part of a camel’s body such as the hooves, differ from those discovered at other Saudi sites. Many are perched high on the outcrops and would have required ropes or scaffolding. One engraving in particular stands out — a camel facing what appears to be a donkey, mule or horse, animals that have rarely been represented in the region’s rock art. “The three dimensional carvings show great skill in their level of naturalism and their sheer size,” Maria Guagnin, from the Germany-based Max Planck Institute for the Science of Human History, told AFP. But the site is shrouded in mystery, with little information on who created the carvings or the tools they used. Khalifah said the closest may be the Nabateans, a nomadic Arab tribe known for founding the city of Petra in modern-day Jordan that was carved out of sandstone desert cliffs. The discovery has shone a spotlight on Saudi Arabia’s rich bedouin heritage. The kingdom is endowed with thousands of examples of painted rock art and ancient inscriptions. Archaeologists last year used Google Maps to find hundreds of stone “gates” built from rock in a remote Saudi desert, which may date back as far as 7,000 years. They also discovered evidence of 46 lakes that used to exist in Saudi Arabia’s northern Nefud desert, which experts say has lent credence to the theory that the region swung between periods of desertification and a wetter climate. The carvings in Al-Jouf may be the most significant recent discovery. “This is an important scientific discovery which reminds us of the important pre-Islamic history of Saudi Arabia,” archaeologist Guillaume Charloux, from France’s Centre National de la Recherche Scientifique (CNRS), told AFP. “I can only hope that it will lead people to discover the variety and richness of the Saudi Arabian past,” said Charloux, who led the research team with Khalifah. The carvings have different styles, which suggests there was more than one artist behind them. It is possible, archaeologists say, that the Al-Jouf site was one of veneration or on a caravan route used as a resting place or boundary marker. “My hypothesis today is that the sculptors are local people, and that the site is an emblematic place on the regional and caravan routes towards Mesopotamia,” said Charloux. More fieldwork is now needed to find the answers. Many of the eroded sculptures are hard to date, but archaeologists estimate they were possibly completed in the first centuries BC or AD. “If they pre-date the domestication of the camel, then they represent wild specimens who may have been hunted, and a successful hunt may have been vital for the survival of the local human populations,” said Guagnin. For now, Saudi authorities are closely guarding the Al-Jouf site from any treasure hunters, amid local speculation of hidden gold. The government is also seeking ownership of the site from the local landowner. Saudi officials who gave AFP the tour pointed out how one of the rocky spurs seen from an angle appears like a human face, with a nose-like protrusion. Also visible alongside the engravings were painted art forms, which showed human and mythological beings and an object that appeared to look like a chariot. Khalifah, however, dismissed some of the art as amateurish, “like a child drawing on paper”, with no indication whether they came before or after the sculptures. “There are so many unanswered questions,” Khalifah said.